For my taste buds, chocolate pudding is about the ultimate taste sensation I can imagine. I am a dark chocolate lover. But, chocolate pudding from a traditional recipe would be relatively unhealthy. Here is a yummy alternative. I found the original recipe from Healthy Holistic Living. However, I experimented with that recipe and changed the amounts of ingredients and added optional toppings to suit my taste. The following is my rendition of this delicious and nutritious treat. 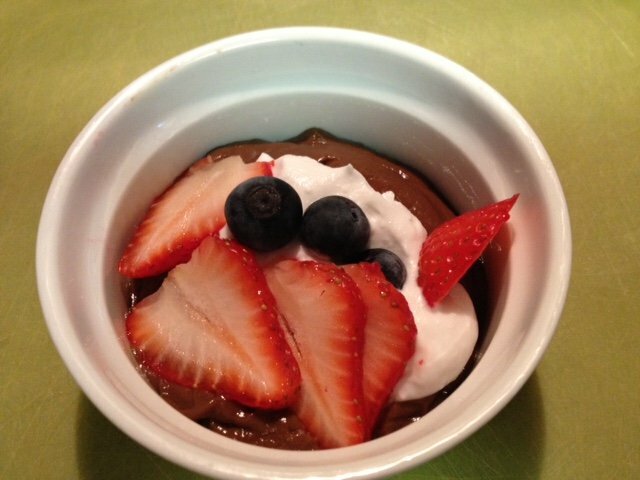 Place avocado, cacao powder, coconut milk, vanilla, coconut oil and raw honey into a mixing bowl and stir well. Use a stick blender on high until completely smooth (approximately 1 minute). Place in serving bowls, and refrigerate for 30 minutes. Add toppings as desired when served.